You must have heard this phrase, ‘James Bond – 007’, but do you know who is he? There are millions of James Bonds fans around the world. However, James Bond is no one, but a fictional character. He was formed in 1953 by a famous writer Ian Fleming; who characterized him in twelve novels and two short-story collections. The character of Bond is secret detective, code number 007, located in London but active internationally. His personality is the foremost thing. Slim build, eyes blue, hair black, scar down right check and on left shoulder, all round athlete, expert pistol shot, boxer and many other things. The inspiration of this character was an intelligence officer in the Secret Intelligence Service, commonly known as M16. Copying the same style, Bond is also called by his code number 007, and was a Royal Naval Reserve Commander. 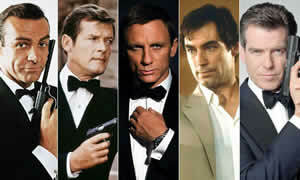 There are 100s of James Bond’s characters books in the market; and the character was also adapted in the movies. There have been twenty-five Bond movies; seven actors have played Bond in these movies.